› Author AffiliationsWe thank the Colombian Institute for Science and Research (COLCIENCIAS) under the project No. RC-0346-2013 for the financial support. A series of N-phenethylcinnamamides were subjected to the Bischler–Napieralski reaction to furnish diverse 1-styryl-3,4-dihydroisoquinolines. We noticed that the desired products were unstable when the reaction was performed under conventional solvent conditions. 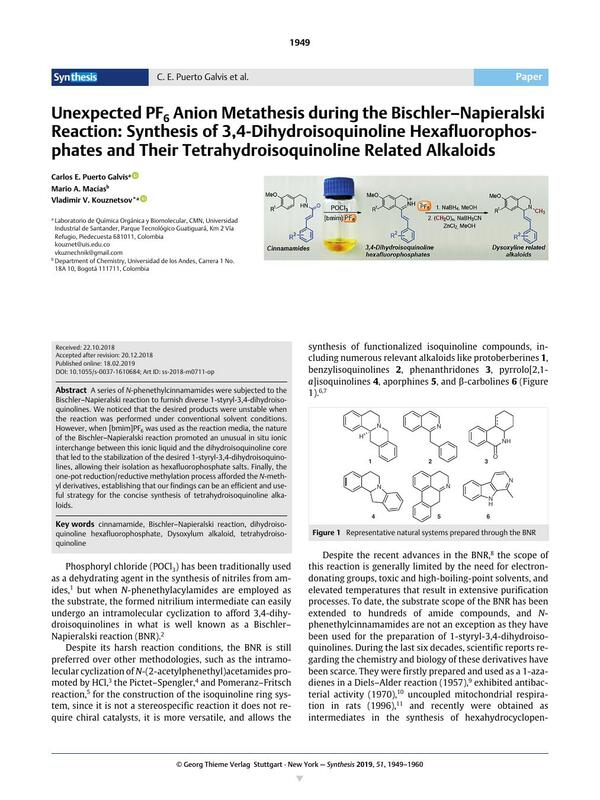 However, when [bmim]PF6 was used as the reaction media, the nature of the Bischler–Napieralski reaction promoted an unusual in situ ionic interchange between this ionic liquid and the dihydroisoquinoline core that led to the stabilization of the desired 1-styryl-3,4-dihydroisoquinolines, allowing their isolation as hexafluorophosphate salts. Finally, the one-pot reduction/reductive methylation process afforded the N-methyl derivatives, establishing that our findings can be an efficient and useful strategy for the concise synthesis of tetrahydroisoquinoline alkaloids. Supporting information for this article is available online at https://doi.org/10.1055/s-0037-1610684. 23 CCDC 1859748 contains the supplementary crystallographic data for this paper. The data can be obtained free of charge from The Cambridge Crystallographic Data Centre via www.ccdc.cam.ac.uk/getstructures.